Preston North End picked up their fifth straight away win by getting the better of Blackburn Rovers in a scrappy derby at Ewood Park. Daniel Johnson scored the only goal eight minutes in with Darnell Fisher sent off late on for Alex Neil’s side. During their fine run in 2019 we have seen the very best of Alex Neil’ side. Saturday was not one of those days. Despite getting the early goal, a slick move built from the back and finished emphatically by Daniel Johnson, this was a day where North End had to battle away. The first half was bitty and scrappy with quality lacking from both sides. The second was a real battle too, Darnell Fisher sent off late on for the visitors. This was a derby though, a big one at that. And given that and the fact PNE need to keep on winning to maintain the pressure on the play-off places, it was all about the three points. North End will play a lot better but this was job done. Ben Davies was nominated for February’s player of the month award and here he reminded us all why he has become one of the best defenders in the Championship. The Cumbrian is a very good footballer and suits Alex Neil’s style down to the ground. But this was a day where had to do the dirty work defensively. Every ball into the box seemed to be met by Davies who marshalled the North End backline to a big win. As well as a ‘Rolls Royce’ of a defender as Neil described him in the week, he is becoming a leader as well. Comfortably North End’s man of the match. Daniel Johnson found himself on the fringes at the start of 2019 as Alex Neil used an almost identical side during the first part of PNE’s unbeaten run. But Ben Pearson’s suspension last week opened the door for the midfielder and he has taken his chance. On target against Bristol City, Johnson made it two goals in two games with an emphatic finish eight minutes in at Ewood Park. That’s seven for the season for Johnson as North End’s midfield continues to provide goals for Alex Neil. For any side, it’s such a boost when you don’t have to rely on your front men to do all the work in front of goal. PNE seem to be doing that better than most with Alan Browne leading the way on 11 goals. Brad Potts’ injury meant that Lukas Nmecha got his chance down the right-hand side at Ewood Park. The Manchester City loanee has divided opinion during his time at Deepdale. Not short of talent with pace to burn and more than a trick or two in his locker, Nmecha’s end product is what has been in question. Early on at Blackburn thought he made a real impact. Driving past Derrick Williams down the wing, he pulled the ball back for Daniel Johnson to hammer home the opener. Playing out wide meant that he had to do his fair share of defensive work and that was certainly something he didn’t shy away from tracking back and putting in tackles when required. A stint through the middle in the second half also showed his versatility. The 7,500 North End fans got the grand day out their efforts deserved. Yes, the game wasn’t a classic but they just needed to go into work on Monday and have bragging rights over their colleagues. 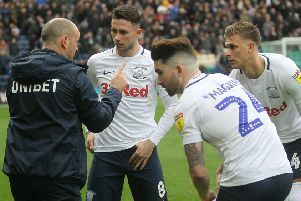 It was refreshing in the week to hear Alex Neil talk about just how big a game this was and the sold out Darwen End will have given every PNE player a reminder of that when they entered the pitch. They sung from start to finish and are getting a real liking for these games, Neil unbeaten in derbies since arriving at Deepdale. In the wider context, those fans will be going away still dreaming of a late run at the play-offs.